Heat up the oven to 475°F. Take neck and giblets off from the bird’s cavity and get ready for cooking gravy. Put the turkey breast-side up in a frying pan. Brush the turkey with the mix of herbs, salt, oil and pepper. Add some herb sprigs to the cavity. Add 3 cups of water to the pan and bind the legs together with the string. Fry the bird approximately 45 minutes, till the skin is golden brown. Take the turkey out from the oven. Roll the breast up with a double layer of foil. Lower the temperature to 350° and keep frying approximately 1 1/4 to 1 3/4 hours. 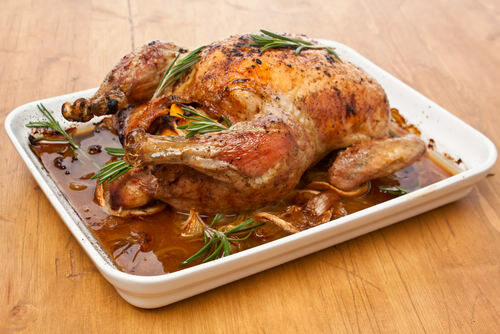 Lean the bird to let the juices run out of the cavity into the pan and add 1 cup of water, if the pan dries out. The turkey is cooked when the thermometer reaches 165°F. Place the turkey in a serving dish and cover with foil. Leave the turkey approximately for 20 minutes. Take out the string and cut. Turkey is a staple of the Thanksgiving table and there are many wonderful and delicious Thanksgiving turkey recipes you may want to try this year. Pick one of these recipes and start cooking right now.